Last-minute shoppers want their fix of Shopkins, Legos, and ... milk. And they're flocking to a new app called Curbside to get them the hassle-free way. Curbside's premise is to help consumers avoid crowded stores and queues, as well as to get around expedited delivery fees that online retailers tend to charge. Curbside lets customers purchase items from select shops nearby through its app. Just 45 minutes later, the items will be bagged and available for pickup at the curb of that store. Don't worry about parking. You don't have to set foot into the shop: A helper will hand it to you. 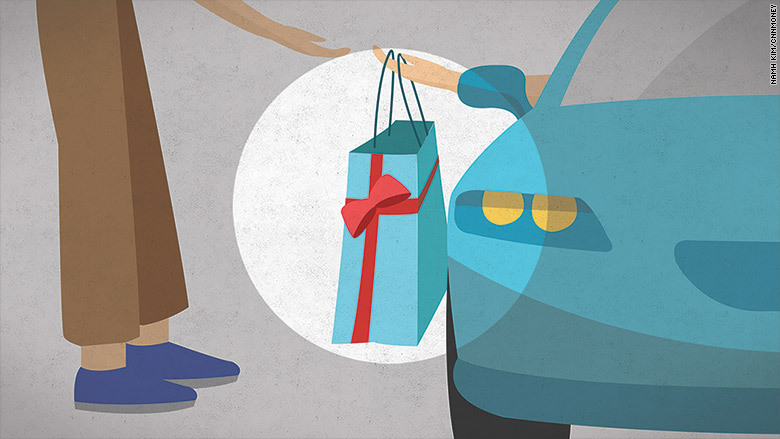 And the service is free: Consumers just pay the cost of the item that's set by the retailer. The one-year-old Palo Alto-based startup is partnered with hundreds of stores which also happen to be popular holiday shopping destinations like Target, Best Buy (BBY) and CVS. Curbside, which has 130 employees, gets a commission from retailers on purchases made through the app. Curbside says retailers benefit from its service: Consumers buy things more often now thanks to the convenience. According to Curbside cofounder Jaron Waldman, the company has seen a major uptick in use this month. Waldman said weekly orders are up 145% (compared to the average week in months prior,) and that the company processes "thousands of orders a day." "We get a spike of orders in the evening -- people are setting up orders to swing by and get it," said Waldman, who sold his last company to Apple (AAPL) and then worked as the head of Apple's location-based services for four years. It's the company's first holiday season serving multiple markets. It's now in New York (but not yet Manhattan), New Jersey, Philadelphia, Chicago, the San Francisco Bay area, and some Los Angeles malls. Last year at this time, it was only in the Bay area. "The amount of stuff people are ordering has [also] really increased," he added. So...what are people buying last-minute? According to Waldman, the top 10 searches are for LEGO, Star Wars, toys, milk, candy, apple, towels, water, Shopkins, and the Apple Watch. And, a lot of people are also looking to buy the Pie Face Game. Curbside, which will be closed Christmas Day, isn't the only tech app looking to make the holidays stress-free. The on-demand delivery firm Postmates is offering free delivery on select last-minute gifts on Wednesday and Thursday. Uber has partnered with Shopify (SHOP) to help local shops in New York, San Francisco and Chicago deliver for free through December 24. And Instacart, an on-demand grocery service, continues to offer shopping and one-hour delivery services in 19 U.S. markets.